Linking your website to NumisMedia is simple and free. The official Price Guide Widgets and NumisMedia Logos below are to be used with the following guidelines. You may only display the widget or logo on your website, and not in any other manner than specified herein. Logos must always be an active link to the NumisMedia home page at www.numismedia.com or the FMV Price Guide at www.numismedia.com/fmv (exception: NumisMedia may authorize links to other pages upon request). 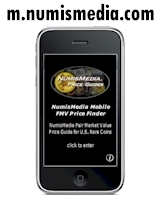 Click here for information on linking to individual series of the NumisMedia Online FMV Price Guide. Widgets and logos may be displayed only on webpages that make accurate references to NumisMedia or its products or services. You may not display widgets and logos in any manner that implies sponsorship, endorsement, or license by NumisMedia. You may not alter the widget or logo in any manner, including size, proportions, colors, elements, or animate, morph, or otherwise distort its perspective or appearance. You may not display widgets or logos on any site that disparages NumisMedia or its products or services, infringes upon any NumisMedia intellectual property or other rights, or violates any state, federal, or international law. These policies do not grant a license or any other right to NumisMedia's price guides, logos, or trademarks. NumisMedia reserves the right at its sole discretion to terminate or modify permission to display widgets and logos at any time. NumisMedia reserves the right to take action against any use that does not conform to these policies. If you have a specific widget need (special design, size, etc...) or if you just want to tell us about the widget you have added to your site, send an email to numismedia@yahoo.com.